It may have been a Million years ago The Light was kindled in the Old Dark Land Within which the illumined Scrolls are all a glow That Egypt gave us with her mummied hand: This was the secret of that subtle smile Inscrutable upon the Sphinx's face Now told from sea to sea from isle to isle; The revelation of the Old Dark Race; Theirs was the wisdom of the Bee and Bird Ant Tortoise Beaver working human-wise; The ancient darkness spoke with Egypt's Word; Hers was the primal message of the skies: The Heavens are telling nightly of her glory And for all time Earth echo. The Great Sphinx is the world’s largest and oldest single stone statues, and most debated. These questions have collectively earned the title “Riddle of the Sphinx,” Just how many millennium the great sphinx has fascinated humanity? The experts differ by over 7000 years varying from the height of the construction of the Pyramids of Giza during the time of Khafre [2603-2578 B.C.] to the theoretical beginning of a precessional great cycle of 25,920 years saying it references today by pointing to a night sky event at the opposite end of these days of changes during the age of Leo about 10,500 BC. Egyptologists, have done pretty well for many generations ignoring the connection of the Sphinx and Ethiopia but Nabta Playa relatively recent 1974 discovery as the world's earliest known archeoastronomical observatory should move the Afro centric debate much closer to Ethiopia. This despite compelling linguistic evidence and the relatively recent discovery of the earliest Stonehenge like observatory at Nabta Playa the evidence that the Egyptians began as an African tribe has not been given its due according to too many African academics and authors. Among the many riddles the Sphinx asks is a distinctive "African," "Nubian," or "Negroid" aspect which is lacking in the face of Khafre. Robert Bauval, a Belgian construction engineer, with a flair for astronomy was among the first to document how the monuments in the Giza region on the earth mimic various constellations in the sky. It was this piece of evidence that the Egyptologists had ignored and still drives to much of the discussion as we adjust to the new concept of moving from the Age of Pisces to the Age of Aquarius. Is this the message of the Sphinx? Together with Graham Hancock, Bauval made the claim in a series of popular books that the three pyramids align with the bright "belt" stars in the Orion constellation. Mathematicians and astronomers endorsed his calculation. Hancock makes the following quotes about Bauval’s calculation. "…the Giza monuments as a whole were so arranged as to provide a picture of the skies not as they had looked in Fourth Dynasty around 2500 B.C., but as they looked…around the year 10,450 B.C." More provocatively he shows that the Sphinx was built well before the other monuments in the area as far back as this date but more likely as a pointer to our own time where we will face similar patterns of worlds in collision as polar ice caps melt. 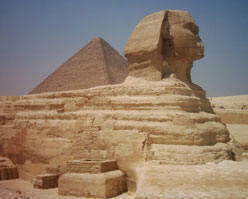 In the early 1990's it was pointed out that the Sphinx prominently wears evidence of rainfall erosion. Such erosion could only mean that the Sphinx is at least 500 hundred years older than nearby pyramids and according to some was carved during or before the rains that marked the transition of northern Africa from the last Ice Age to the present interglacial epoch, a transition that occurred in the millennia from 11,000 to 3000 BC. The Sphinx age controversy has been an unwelcome distraction to mainstream scholars. At the present all they concede is that the focused attention on the geological and environmental history of the monument is a good for promoting preservation. Any claims of undiscovered knowledge have been wholeheartedly dismissed by the orthodoxy, yet the truth that the stars communicate continues to be heard from a new branch of science known as archeoastronomy. We all feel a sense of wonder about the stars where we are told the rules of everyday time and space do not apply. The Egyptians and Mayans may have had priests among their number who could navigate this world as souls. There may not be another date as potent as 21DEC12 in our lifetime to bring focus to ourselves as the consciousness of humanity representing the mind of our solar system in a vast universe, so come on down to the 2012 beach and enjoy the sun and waves. Imagination is more helpful than science while you are here. it was called "Horus of the Horizon" and "Horus of the Necropolis", the sun god that stands above the horizon. The Great Sphinx is a statue with the face of a man and the body of a lion. Carved out of a natural limestone outcrop, the Sphinx is 19.8 meters (65 feet) high and 73.2 meters (204 feet) long. it is located a short distance from the Great Pyramid. You suppose marvelous powers in the artist; but, as language is more pliable than wax or any similar substance, let there be such a model as you propose. In 1922, Howard Carter, an English archeologist, “discovered” the tomb of this young king who had ruled Egypt about 3300 years ago, from 1336 to 1327 B.C. Today this lesser boy ruler, known for riches never purloined by grave robbers is the focus of race relations between a Euro centric view and multicultural view which holds that world history needs to acknowledge a prominent role of Africa in what was the longest living and most influential culture of the last three great years of the precession. Detective Frank Domingo, senior forensics artist with the New York City Police Department used on facial photographs are not unlike methods orthodontists and surgeons use to study facial disfigurements. From the right lateral tracing of the statue's worn profile a pattern of bi-maxillary prognathism is clearly detectable. This is an anatomical condition of forward development in both jaws, more frequently found in people of African ancestry than in those from Asian or Indo-European stock. The carving of Chephren in the Cairo Museum has the facial proportions expected of a proto-European. The Sphinx for many years was held by academics to resemble Khafre, the pharaoh who built one of the nearby pyramids of Giza. and 12,000 ago when the last ice age ended. However this is no longer appears to be the case. In 2004, French Egyptologist Vassil Dobrev announced the results of a 20-year reexamination of historical records and uncovering of new evidence that suggest the Great Sphinx may have been the work of the little known Pharaoh Djedefre, Khafra's half brother and a son of Khufu (Cheops), the builder of the Great Pyramid of Giza. Dobrev suggests it was built by Djedefre in the image of his father Khufu, identifying him with the sun god Ra in order to restore respect for their dynasty. In the 1980's, a carefully planned restoration of the Sphinx was in progress. Over 6 years, more than 2,000 limestone blocks were added to the body of the sphinx and chemicals were injected. This treatment did not work. It just flaked away along with parts of the original rock. Later, various mortars and many workers who were not trained in restoration worked for six months to repair it. In 1988 the left shoulder crumbled and blocks fell off. Present attempts at restoration are under the control of the Supreme Council of Antiquities' archaeologists. They are concentrating on draining away subsoil seepage which is damaging the rock. They are also repairing the damaged shoulder with smaller blocks and staying with the original size. The word "sphinx", which means 'strangler', was first given by the Greeks to a fabulous creature which had the head of a woman, the body of a lion and the wings of a bird. In Egypt, there are numerous sphinxes, usually with the head of a king wearing his headdress and the body of a lion. There are, however, sphinxes with ram heads that are associated with the god Amun. Pieces of the Sphinx's massive beard found by excavation adorn the British Museum in London and the Cairo Museum. The human head is on a scale of about 30:1, while the lion body is on the smaller scale of 22:1. There are three passages into or under the Sphinx, two of them of obscure origin. The one of known cause is a short dead-end shaft behind the head drilled in the nineteenth century. No other tunnels or chambers in or under the Sphinx are known to exist. "Ethiopia produces Lynxes in great numbers, and Sphinxes with brown hair and a pair of udders on the breast, and many other monstrosities." Herodotus (5th Cent. BC) in his "History" (Book II) recounts the Egyptian astronomer's report of the time span of their observations. "During this time there were four occasions when the sun rose out of his wonted place - twice rising where he now sets, twice setting where he now rises." This could well be reference to complete cycles of the 25,920 year precession before the night sky repeats itself. If precession - then we could be talking about an oral history stretching back 39,000 years. The Great Sphinx has long been commonly accepted by Egyptologists to represent the likeness of King Khafra (also known by the Hellenised version of his name, Chephren) who is often credited as the builder as well. This would place the time of construction somewhere between 2520 BC and 2494 BC. Because the limited evidence giving provenance to Khafra is ambiguous and circumstantial, the idea of who built the Sphinx, and when, continues to be the subject of debate. Using sophisticated computer simulations of ancient skies, pioneering archeoastrologists Graham Hancock and Robert Bauval showed that the lion is a reference to the constellation of Leo during his zodiac age in the year 10,500 BC. They call this the Egyptian's creation story, the Zep Tepi or "first time." It was from the 'womb' of Isis-Sirius that was born the divine child, Horus. A date of 10,500 B.C. is chosen because they maintain this is the only time in the precession of the equinoxes when the astrological age was Leo and when that constellation rose directly east of the Sphinx at the vernal equinox. Hancock and Bauval also suggest that in this epoch the angles between the three stars of Orion’s Belt and the horizon was an “exact match” to the angles between the three main Giza pyramids. Bauval, in a series of separate and collaborative publications from the late 1980s onwards. Their claims include that the construction of the Great Sphinx and the monument at Tiwanaku in modern Bolivia was begun in 10,500 BC; that the Sphinx's lion-shape is a definitive reference to the constellation of Leo; and that the layout and orientation of the Sphinx, the Giza pyramid complex and the Nile River is an accurate reflection or “map” of the constellations of Leo, Orion’s Belt and the Milky Way, respectively. A date of 10,500 B.C. is chosen because they maintain this is the only time in the precession of the equinoxes when the astrological age was Leo and when that constellation rose directly east of the Sphinx at the vernal equinox. This time period coincidentally also coincides with the American psychic Edgar Cayce’s “dating” of Atlantis. These and other theories are used to support the overall belief in an advanced and ancient, but now vanished, global progenitor civilization. French Egyptologist and Director General of Excavations and Antiquities for the Egyptian government, Gaston Maspero, who surveyed the Sphinx in the 1920s asserts: The Sphinx stela shows, in line thirteen, the cartouche of Khephren. I believe that to indicate an excavation carried out by that prince, following which, the almost certain proof that the Sphinx was already buried in sand by the time of Khafre and his predecessors. Notwithstanding this, the Sphinx’ link with Khafra continues to be the view most widely held by Egyptologists although just in 2004 a 20-year study suggested the sphinx was a close relative of Khufu.